In 2018, 539 active and vibrant Greenspring volunteers contributed 63,936 hours of volunteerism. 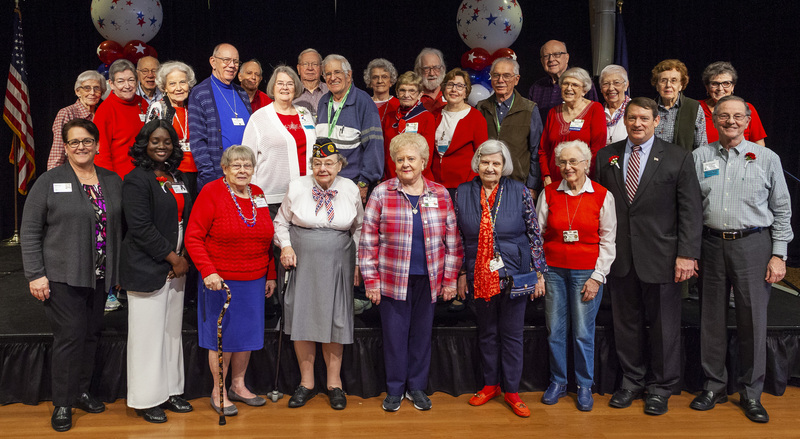 At the ceremony, nearly 200 Awards were presented to volunteers with 100-500+ hours in 2018, and four Lifetime Achievement Awards were given to those with 4,000+ hours in their lifetime. Fairfax County Supervisor Jeff Herrity was present from the Board of Supervisors - Springfield District to celebrate, thank and honor our volunteers for their contributions to a diverse range of groups, as well as their dedication to providing assistance at Greenspring’s Continuing Care neighborhood with programs such as Friends Visiting Friends, Pet Visit Program, and the Ambassador Program. "The success and strength of the Volunteer Program at Greenspring is largely due to the many unique talents and skills of our residents, who are willing to be engaged and supportive in meaningful and helpful ways," said Uvonne Andoh, Volunteer Program Coordinator at Greenspring. "Our volunteers generously and consistently give their time, resources and knowledge to enhance life at Greenspring, beyond the gates of our community, and amongst each other. Greenspring is honored to celebrate our volunteers for their hard work, which we know is done through a true compassionate heart of giving." About Greenspring: Greenspring, one of 20 continuing care retirement communities developed and managed by Erickson Living®, is situated on a scenic 58-acre campus in Springfield, Virginia. The non-profit community of more than 2,000 residents and 1,000 employees is governed by its own independent board of directors which is supported by National Senior Campuses, www.nationalseniorcampuses.org. The board provides long-term financial security and operational oversight for the residents. Additional information about Greenspring can be found at www.GreenspringCommunity.com.